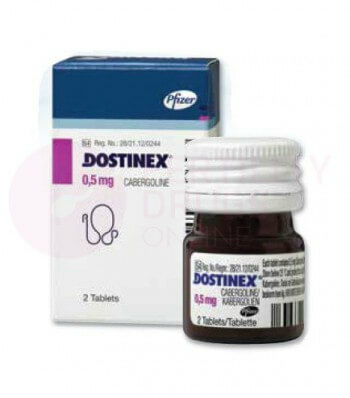 Dostinex, with the generic name Cabergoline, is a dopamine receptor agonist in the form of an oral pill. This ergot medication can be used in fertility treatments to reduce high levels of prolactin in the body, since this hormone can cause infertility. Doctors usually prescribe Dostinex 0.5 mg to treat hyperprolactinemia, which is high levels of the hormone prolactin in the body. This condition can be caused by tumors in the pituitary gland, which are called prolactinomas, or other disorders which trigger the pituitary gland to produce too much prolactin. Doctors may also prescribe this drug to prevent lactation, which is milk production, following childbirth, an abortion, or stillbirth. When too much prolactin in the body causes missed periods, unwanted milk production which is called galactorrhea, or infertility, doctors may prescribe this particular medication to keep prolactin levels in check and minimize these symptoms. Hyperprolactinemia can affect both women and men. Sometimes a tumor or other problem can cause the pituitary gland to produce too much prolactin, a hormone that triggers the body to produce breast milk among other hormonal changes. Although breast milk is important for nourishing a child, it can be inconvenient and embarrassing for women who are not breastfeeding, and for men, it can be embarrassing as their breasts become enlarged. However, high prolactin levels can also cause other problems such as a decreased sexual desire and ability in men and missed or irregular menstrual periods in women. As the prolactin hormone affects and even stops ovulation, it can cause infertility. The drug works by affecting dopamine receptors in the pituitary gland, which prevents the gland from producing prolactin. This reduces the amount of prolactin in the body, allowing ovulation to begin again so that an egg can be released and potentially fertilized. Your fertility doctor will give you instructions on how and when to take Dostinex. You will take tablets orally, either with or without food. You may only take tablets twice a week, and a calendar or electronic reminder can help you remember when you should take the fertility drug. These may not be all the possible side effects of this medicine. Dostinex may interact with other medications and may be contraindicated in certain medical conditions, so always tell your fertility doctor which drugs you are taking and which medical conditions you have. This medicine may also interfere with certain laboratory tests so always inform your doctors if you are taking this medication. Keep the drug out of the reach of children and store this medication at room temperature, away from heat, light, and moisture. Discuss with your doctor if you are pregnant or breastfeeding. Be aware that this drug may cause drowsiness or dizziness, so be sure you know how you react to Dostinex before driving, operating machinery, or other dangerous tasks. Your fertility doctor may prescribe Dostinex tablets to reduce prolactin along with other drugs or hormones to boost fertility. You may also use fertility monitors and ovulation tests to determine the best time to conceive. Hyperprolactinemia is a medical condition in which the body has excess prolactin, which is the hormone that triggers the production of breast milk. This can be caused by a tumor in the pituitary gland that secretes prolactin, called a prolactinoma, a large tumor that compresses the pituitary gland, medications including psychiatric drugs, and of course, recent pregnancy. Both women and men can be affected by hyperprolactinemia, and in women this excess prolactin causes symptoms like breast milk secretion, loss or irregularity of menstrual periods, and infertility, and in men the excess prolactin can cause breast enlargement, loss of libido and impotency, and a low sperm count. Although hyperprolactinemia can cause infertility in both women and men, treating the high levels of prolactin can help increase fertility. The high cost of fertility treatments, including expensive fertility drugs, can be a financial burden for prospective parents on a tight budget. We can help you reduce the cost of your fertility treatment. As a licensed online pharmacy, we aim to help you purchase affordable Dostinex. Speak to your fertility doctor first to find out if this medication is right for you, then bring your prescription to us. Submit your information online or phone our customer service hotline and one of our partner pharmacies will send your medication with free shipping. You can then begin to lower your prolactin levels and increase your chances of conceiving a child.